Major national and international sporting events such as the Olympic Games, FIFA World Cup tournament, NFL Super Bowl, and Boston Marathon present many policing and security challenges for event hosts. These events take place in large, and complex locations; such events can attract a range of criminal activities from disorder and violence to cyber attacks and terrorism. Event hosts and venue owners are faced with the challenge of providing a smooth-running and successful event while keeping event participants and spectators safe and secure. Thus, a partnership was formed between NCS4 and INTERPOL to address these safety and security challenges. 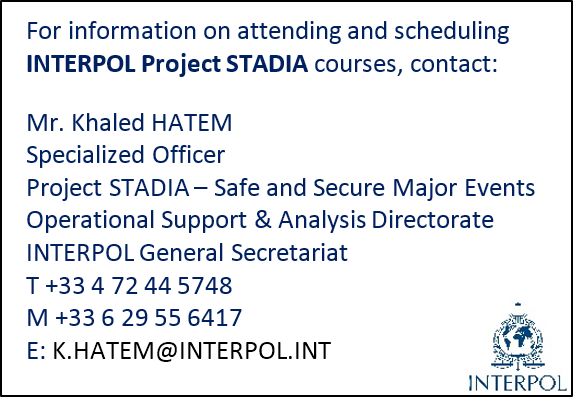 In 2012, INTERPOL, in cooperation with Qatar, established Project STADIA to create a Center of Excellence to help INTERPOL member countries in planning and executing policing and security preparations for major sporting events. With its global network of experts in 192 member countries, INTERPOL is ideally placed to serve as a centralized hub for research, design, planning coordination and training to help meet this challenge, within a structure that assures high standards and quality. 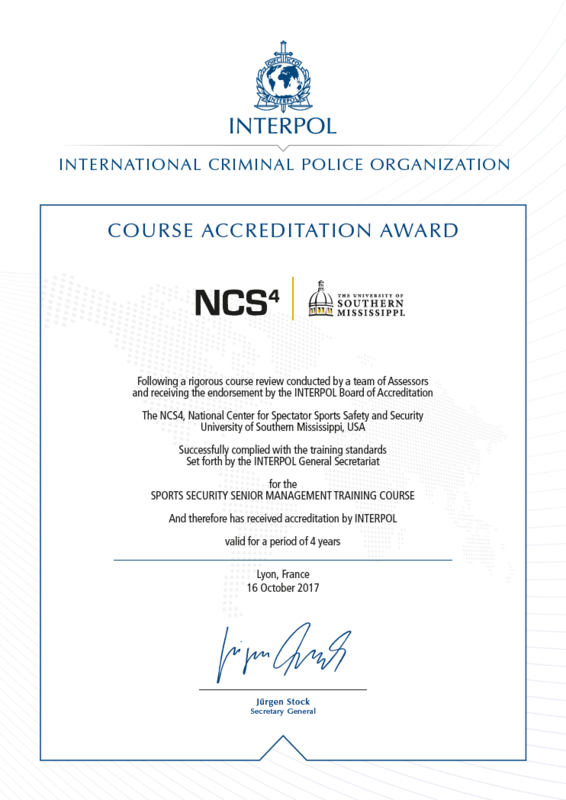 In 2016, an agreement was established between INTERPOL and the University Southern Mississippi's USA, National Center for Spectator Sports Safety and Security (NCS4) built on a common interest of contributing to police cooperation through strengthening training activities for police officers serving sport security functions. INTERPOL helps to build the capacity of police in their 192 member countries, equipping them with the knowledge, skills and best practices needed to meet today's policing challenges. 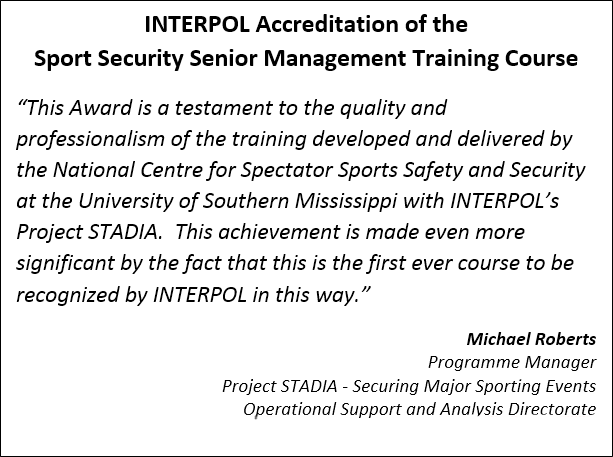 http://news.usm.edu/article/center-spectator-sports-safety-and-security-signs-agreement-interpol . NCS4 and INTERPOL are developing six international training courses (see inset for INTERPOL and NCS4 Training Courses). The first course, Sport Security Senior Management Training Course, was taught from September 12-14, 2017, in Lyon, France. Participants from 27 countries attended the inaugural course. This course has the distinction of being the first course in the world to receive INTERPOL accreditation. The target audience for all six courses are Police Executives and Incident Management Team members. Beginning in the fall of 2020, Police Executives and Incident Management Team members who complete all six courses may be eligible to earn the International Sport Safety and Security Professional Certificate. Click here to see the International Sport Safety and Security Professional Certificate courses. Click here to see more information on our strategic partners. 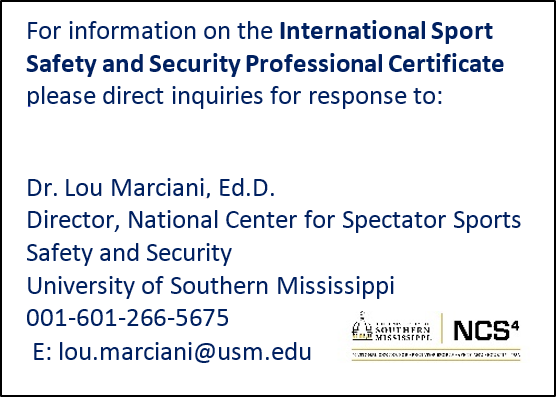 The National Center for Spectator Sports Safety and Security (NCS4) at the University of Southern Mississippi, supports the advancement of sport safety and security through training, professional development, academic programs and research. NCS4 collaborates with professional leagues, open access events, intercollegiate and interscholastic athletics, along with professional associations, private sector firms, and government agencies. It is a critical resource for sport venue managers, event managers, first responders, and other key stakeholders. INTERPOL is the world’s largest international police organization, with 192 member countries. Their role is to enable police around the world to work together to make the world a safer place. Their high-tech infrastructure of technical and operational support helps meet the growing challenges of fighting crime in the 21st century.